You might remember when we did a four day hike in Guatemala where we did 60 kms (24 miles) in the highlands. That was a fantastic experience, but it was also very inexpensive. This hike in Colombia costs 700,000 COP (Colombian Pesos) which is the equivalent of about $340 CAD. And of course there's two of us, so we can double that. But, it looks like a once in a lifetime thing. 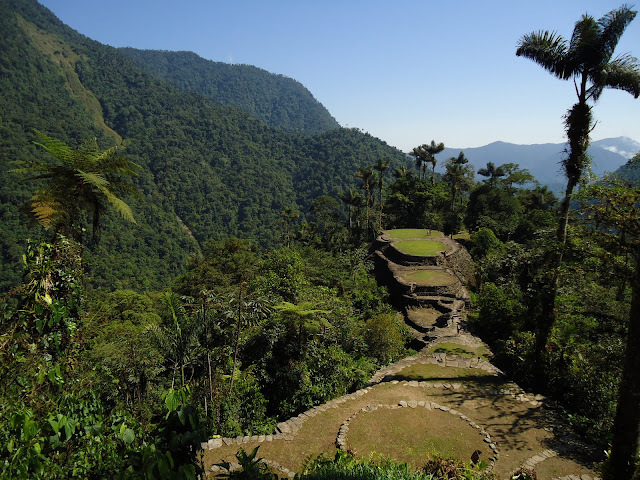 There are only four tour operators that do hiking trips to Colombia's Lost City (Ciudad Perdida). And, you have to use one of those tour operators to get to the Lost City. It's not something you're allowed to do on your own. This hike is a little shorter than the one we did in Guatemala, at 44 kms (27 miles). And you can choose to do it in 4, 5, or 6 days. Oddly, the longer trips are not that much more expensive than the 4 day one which is strange because the prices include your meals and basic overnight accommodation. The area was only discovered in 1972, although the local indigenous groups were aware of it. The hike looks tough, and if it rains that trail gets muddy and some of the river crossings are chest deep. But on the bright side, you don't have to carry any of your food or sleeping equipment. So our packs won't be nearly as heavy as they were on our hike in Guatemala. One of the tour companies is owned by one of the indigenous groups. I think that's the one we would probably use, although who knows at this point. I'll have to do some research and see which one has the best reviews. I can't figure why it's so expensive, however maybe it has something to do with the government not letting very many people into the site, and it's possible that entry fees to do so are very high. Looks like a fantastic experience and we can't wait to tell you about it ourselves. The more we research Colombia, the more we're looking forward to it! And, a very happy Father's Day wish goes out to Ruth's dad Tony who is celebrating with his great grandchildren today. And Happy Father's Day to all of the fantastic dads out there! The ladybugs may seem odd, but they are great at controlling aphids if they are a problem in your garden. I considered getting some this year! It sounds like an amazing hike. You will never forgive yourselves if you don't take it. Once in a lifetime opportunity. Go for it. That's exactly what I said to Kevin as well! We want to do it now before it becomes so well known that it gets a waiting list like Machu Picchu. Hope you take the longer hike. Remember you are not 25 now!!! We are thinking of the 5 day hike! It also won't be as hard as the Guatemala hike because we will only have a day pack not those big heavy multi day hike backpacks. Very likely the hike is expensive due to access fees, although I have heard that the prices in Columbia are starting to creep up now that they are seeing some tourism. Sounds amazing! You might consider investing in a cheap waterproof camera rather than taking your existing camera. We purchased a waterproof Nikon Coolpix(goes to up to 10 feet deep for snorkeling too) that came in very handy in a recent tropical storm and was about $80 last summer (new ones go for about $175 but it was previous years stock at SDM). I am positive you will encounter lots of wet conditions in the jungle. That is probably one of the reasons. We have also heard that prices there are starting to go up but from looking at accommodation in Colombia, it sounds pretty inexpensive but not as cheap as Guatemala. Yes, we were actually thinking of replacing my little camera this year with a waterproof one, we think it would definitely be a good idea. Thanks for the suggestion. All I can say is "Wow", it does sound like the trip of a life time!! I think I would be researching info on tropical travel medicine stuff like parasites/fungal infections etc for that area, just because I had the time! Can't wait! It definitely sounds pretty intriguing and right up our alley. In years to come it could become like Machu Picchu and then at least we will be able to say that we did it before it became a "real" tourist attraction. If we started looking into all that tropical travel medicine stuff we probably wouldn't want to travel, lol!